Memphis interior decorator Wayne Shielly doesn’t believe in gutting perfectly good kitchens for the latest trend. He does believe in tweaking, though, and he’s certainly done plenty of that in his builder’s standard kitchen. 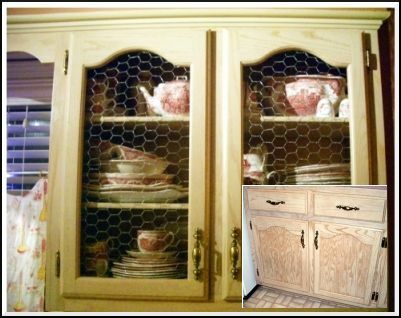 One of his favorite projects was a cabinet door makeover, where he replaced the wood panels in his upper cabinet doors with chicken wire. That not only gave him a vintage look, but it allowed him to see his kitchen items as well. Wayne replaced the panels on fitted kitchen cabinets, but you can try this project on any flea market furniture with panel doors. If you go with your flea market find clean and stain or paint it before you start work. A shabby corner cupboard is a perfect candidate for a makeover that won't cost you a whole lot of money. Remove your cabinet doors from the cabinet. For most hinges, you'll need to use a screwdriver. Drill a pilot hole for the jigsaw on the edge of the panel, as close to the frame as you can get without damaging it. Place your cabinet door outside up, so you can follow the shape of the panel. Using the pilot hole to start, cut out your panel with the jigsaw, following the lines of the panel. If you don't have a lot of jigsaw experience, try practice cutting on a scrap piece of wood before you put the saw to your cabinet door. Using the cutout panel as a pattern, cut your chicken wire. Make the chicken wire about 1.5 inches larger than the opening all the way around, or as large as the frame will allow if that's too big. You can always cut the wire closer if you need to. 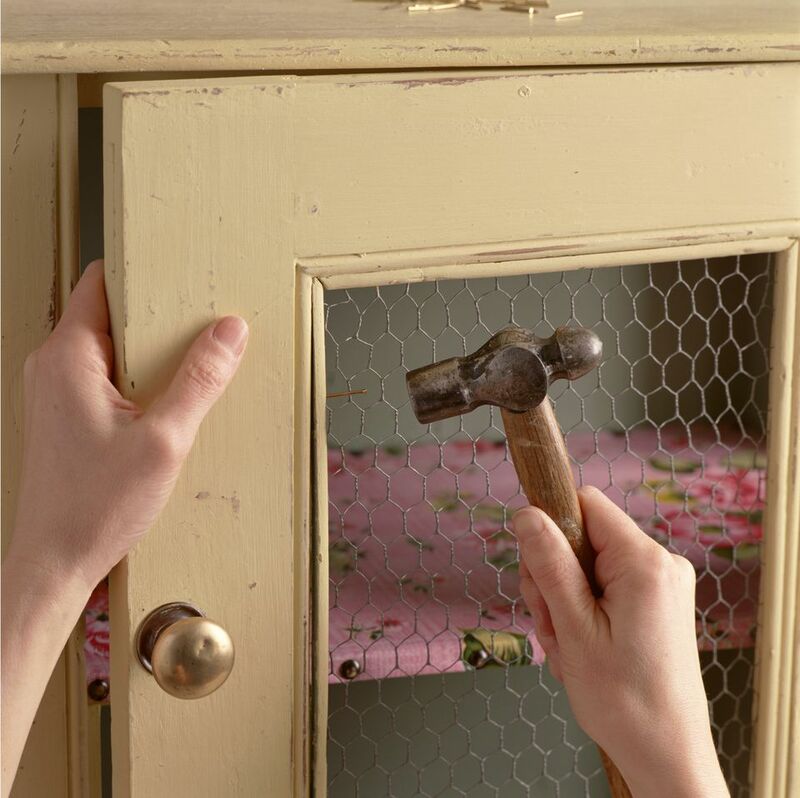 Staple the chicken wire panel to the cabinet door frame, stretching it taut while you're doing the stapling. You don't want your wire to sag. Don't skimp on staples. Your panels need to be firmly attached to the frame. Add string lights or a light strip. Wayne chose inexpensive hardware store plug-in light strips for the cabinets, to really highlight his newly exposed cabinet interiors. Follow the installation instructions on your light kit, but be prepared to drill a small hole through each shelf for the wire. It needn't be a large hole if you choose a light kit with a plug that attaches to the wire after installation. Reattach the doors to the cabinets, and get ready for the rave reviews. Enjoy your new chicken wire cabinet panels. Play with different arrangements of dishes, glassware, or decorative objects, and show off your new display space to its best advantage.